British Gas has created a brand called Hive to house all its internet-enabled technology products and will launch the first Hive-branded product next month. Hive active heating will cost £199 and will allow customers to control their heating and hot water remotely via an app, SMS or website. British Gas already offers a product called remote heating control that allows its one million customers with smart meters to control their heating via an app or website free of charge. 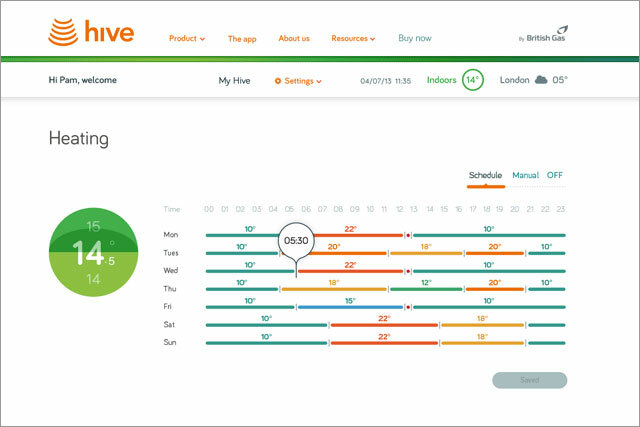 Nina Bhatia, managing director of British Gas connected homes, claimed Hive active heating was a "substantially new product and not just an upgrade" to remote heating control. Hive active heating requires the installation of a physical kit, including a hub that connects into a broadband router, a wireless receiver and an electronic thermostat. Bhatia said the £199 price included the kit and the installation fee, which would usually be worth about £80, but added that British Gas was not making a loss when installing the product. Once the kit is installed British Gas will be able to introduce new products and services under the Hive brand name with new products set to emerge "over the next few months". Bhatia said Hive active heating would be differentiated from remote heating control because it could also control hot water, which accounts for 20% of the energy bill. She added that It would also be easier for customers to control their heating using Hive, which presented a "totally revamped user experience." The product will go on sale on 14 October and will be installable in homes by 21 October. The launch will be supported by "quite a big marketing campaign". Around 27,000 customers have used British Gas’s remote heating control product since it launched a year ago, a figure Bhatia said she was pleased with, considering there had not been much marketing around it. Bhatia said: "This is a nascent product category and when you are in such a category, the thing you focus on is delivering a product customers really love and you learn from that. You don’t set massive targets at the beginning because you don’t know what is going to happen with the market." Customers will have to give permission to allow British Gas to use data collected via Hive and the energy company is promising not to sell any data to third parties. Bhatia added that British Gas would continue to invest in new products and services if Ed Miliband wins the next general election and carries through his pledge to freeze energy prices for two years.